An Intentional Discipleship (ID) Bible study has (1) a small group Bible study leader who has received official ID leadership training and (2) four key components. Individually these components are not unique, but together they form the powerful core of the ID Bible study process. Objective: Lamplighters is a discipleship training ministry has a dual objective: (1) to help individuals engage with God and His Word and (2) to equip believers to be disciple-makers. The small group format provides extensive opportunity for ministry training, and it’s not limited by facilities, finances, or a lack of leadership staffing. Content: The Bible is the focus rather than Christian books. Answers to the study questions are included within the study guides so the theology is in study material, not in the leader’s mind. This accomplishes two key objectives: (1) It gives the group leader confidence to lead another individual or small group without fear, and (2) it protects the small group from theological error. 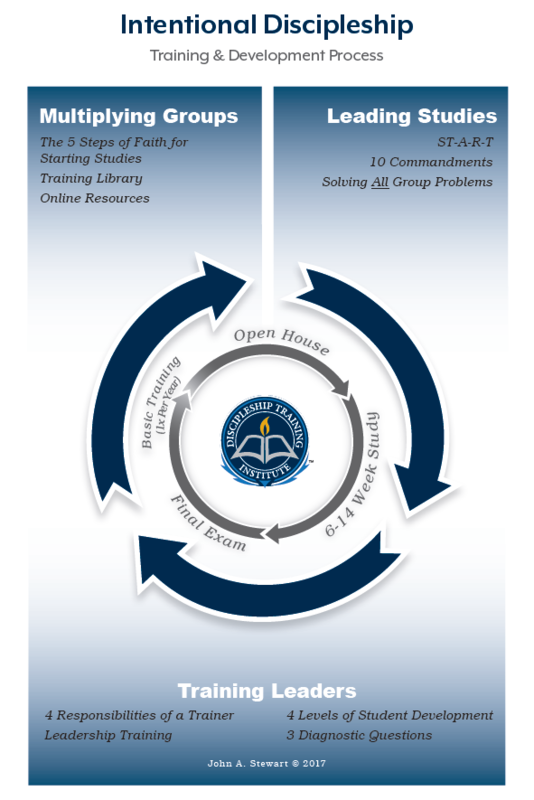 Process: The ID Bible study process begins with an Open House, which is followed by a 6–14 week study, which is followed by a presentation of the Final Exam (see graphic below). This process provides a natural environment for continuous spiritual growth and leadership development. Leadership Development: As group participants grow in Christ, they naturally invite others to the groups. The leader-trainer (1) identifies and recruits new potential leaders from within the group, (2) helps them register for online discipleship training, and (3) provides in-class leadership mentoring until they are both competent and confident to lead a group according to the ID Bible study process. This leadership development process is scalable, progressive, and comprehensive. There are three stages of leadership training in the Intentional Discipleship process: (1) leading studies, (2) training leaders, and (3) multiplying groups. How Can I Be Trained? If you are new to training, Level 1 (Basic Training) is where you will want to start. Level 1 training teaches you a simple 4-step process (ST-A-R-T) to help you prepare a life-changing Bible study and 10 proven small group leadership principles that will help your group thrive.